ZURICH (AP) — American sprinter Noah Lyles raced through a slight headwind to win the 200 meters in 19.67 seconds at the Diamond League finals on Thursday. 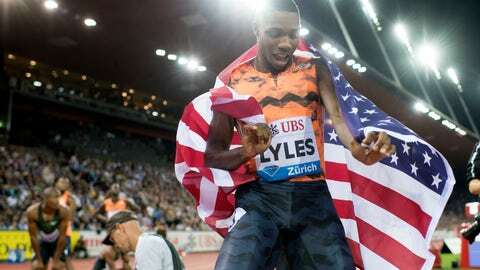 The 21-year-old Lyles clocked just 0.02 outside his world-leading, lifetime best performance set in Monaco last month. Lyles trailed only 0.01 behind Usain Bolt’s meeting record from 2012 for the storied Weltklasse gathering. World champion Ramil Guliyev of Turkey was left trailing Lyles in 19.98. Olympic champions Caster Semenya and Conseslus Kipruto also gave standout displays on Thursday. South African Semenya dominated the 800 meters in 1 minute, 55.27 seconds — a full second outside her lifetime best set in Paris this season yet more than a half-second faster than any other woman this year. Ajee Wilson of the U.S. was second in 1:57.86. Running on one shoe for much of the 3,000 steeplechase, Kipruto of Kenya still finished 0.04 ahead of Moroccan Soufiane El Bakkali. Kipruto’s left shoe slipped off early in the race yet he led with two laps to go, and just held off El Bakkali. A 30-year-old Weltklasse record fell in the men’s shot put to Tomas Walsh of New Zealand. Walsh’s 22.60-meter throw was seven centimeters short of his own world-leading effort. The second half of the finals on the season-long Diamond League circuit is Friday at the Memorial Van Damme meeting in Brussels.